Barbara wrote a blog post a few weeks ago on the state of Internet penetration in China. The figures reassured that the country remains divided with Internet adoption rates below 30 percent in Jiangxi at the lower end and more than 70 percent in Beijing at the upper bound. For those being familiar with China, or any other emerging country for that matter, the digital divide comes not as a surprise. But most of us can’t help to be impressed about the rapid progress that China has made in connecting almost 600 million individuals to the Internet within a view years time. Yet, these numbers have very little to say about the quality of online experiences. I lived in Beijing between 2011 and 2012; and in deed access or coverage was never an issue. At the same time, however, data transmission speeds were painstakingly low. What is more, I had to buy poor performance for almost double the price than here in Sweden. Admittedly this comparison is not really fair since economic development is a decisive factor for data infrastructure development. 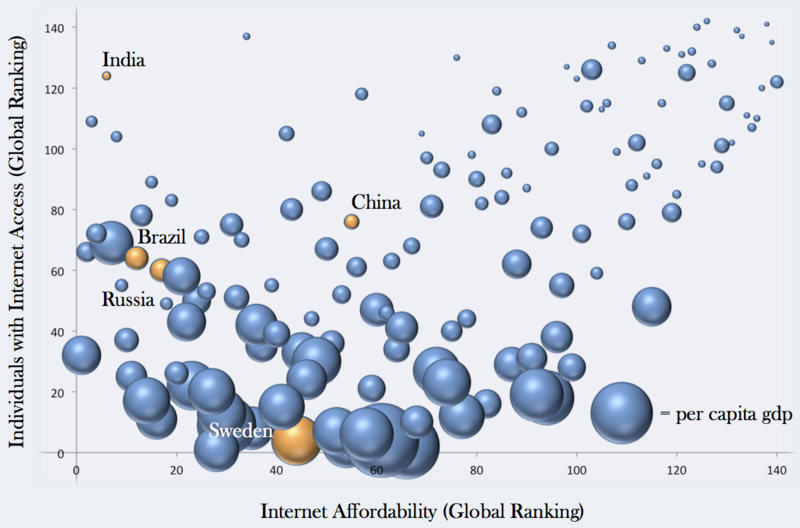 I, therefore, set my personal experience into a global perspective in the chart below, which depicts the World Economic Forum Rankings in terms of Internet affordability, availability, and per capita GDP (bubble size) in 2012. I highlighted the BRICs (Brazil, Russia, India, and China) in orange, because they face some similar challenges; in particular vast territories, large populations, low to medium income levels, and rapid but uneven growth. 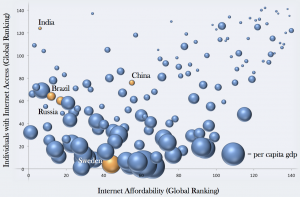 The chart shows that the poorest nations in the world often provide Internet access at very high prices to a tiny segment of the population. The richer a country the higher is the likelihood that a large share of the population is connected to the Internet. Prices, by contrast seem not to depend on the income level. That is actually not so strange since we do not only pay Internet Service Providers (ISPs) for granting access but more so for data transmission speeds. Speed matters because the slower a connection the less applications you can run and, as I experienced quite often in China, access to the Internet becomes essentially useless. Thus getting connected is a necessary but not a sufficient condition to participate in the virtual world. From this perspective it becomes clear that divergent transmission rates constitute another digital-divide that we should keep in mind when we study the emergence and development of digital societies. During the coming months I will devote my blog posts to this topic in a comparative perspective. In this post I am going to look at download speeds and try to solve a really strange puzzle. In the figure below you can see how daily download speeds (provided by Ookla Netindex) in the BRICs developed between 2008 and 2012. Obviously there is a widening performance gap between emerging countries. Russia went far ahead, India stagnates at a very slow speed level, and China and Brazil muddle somewhere in between but still at a distance to the world average. There are probably many factors that make a comparison somewhat biased but it still seems that the Russians did something that China, Brazil, and India missed out. As a political economist it was my firm belief that there only can be two factors shaping this outcome: markets or policies. And here the story becomes really strange. 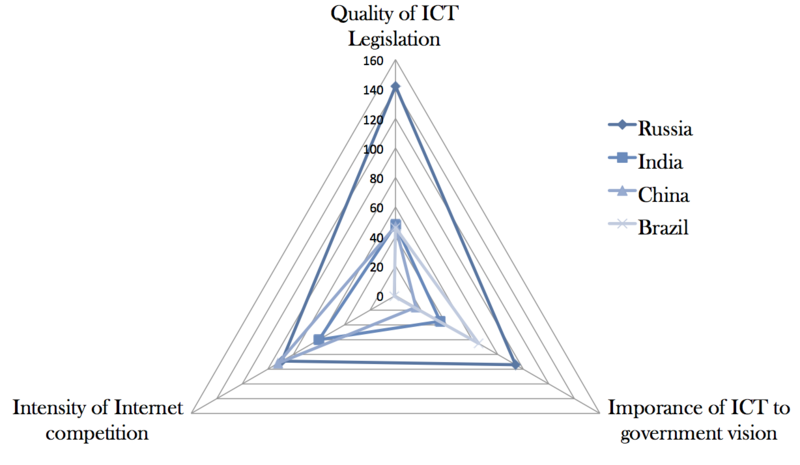 The chart below shows the BRICs’ respective global rankings in terms of ICT legislative quality, market competition, and the importance of ICT for the governments’ political visions (World Economic Forum Rankings). 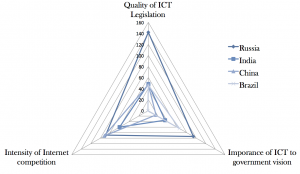 Russia is as competitive as heavily market regulated China, ICT legislation is considered to be the worst among 140 countries, and Russia puts the least emphasize on ICT as part of its overall political aims among the BRICs. This puzzle brings us now back to what we can’t help to be impressed about; the rapidly progressing Internet adoption in China. Speed restrictions on data highways follow the same principle as on any other highway, the more crowded the slower you can move. This is why we would believe that companies will be eager to provide the needed capacity given that there is money in it (the market argument) or if the social positive effects of high data transmission capacity outweighs the private economic returns a dedicated government would use nicely designed policies to allocate tax payers’ money in order to compensate for market failure (the policy argument). Since both arguments seem not to hold true for the case of Russia, we need to consider an additional factor, namely timing; in other words you can drive much faster at nighttime than during rush hours. I followed up on this issue with a Bass forecasting model on broadband adoption defined as high-speed data transmission with at least 2.5 Mbps. In a Bass model there are two different user segments; first adopters (innovators) and late adopters (imitators). First adopters are conscious about how broadband generates benefits for them and they are prepared to pay markups in order to get connected. Innovators are crucial for setting the pace for broadband diffusion due to four reasons: First, they enhance user value for broader consumer segments by creating new relevant digital content. Second, they make the potential user value for late adopters more comprehensible. Third, they provide important feedback in an early stage of market development and thus help to improve service quality and technology performance. And fourth, first adopters’ high willingness to pay provides the profit margins that are need for reinvestment in backhaul capacity. I assumed that the BRICs are heading towards a preliminary market saturation rate of 35 subscriptions per 100 inhabitants; this is about the average of broadband penetration in industrialized countries. The Figure below depicts the results indicating that technology diffusion patterns are s-shaped. This outcome is common for most technology markets even though there are exceptions such as the case of South Korea where broadband policies where effective in defying s-curved technology adoption. The steepness of the slope depends on the size of the first adopter crowd. The larger it is the more forcefully translates the bandwagon effect into market growth. This effect is strong in Russia and China and quite weak in India. 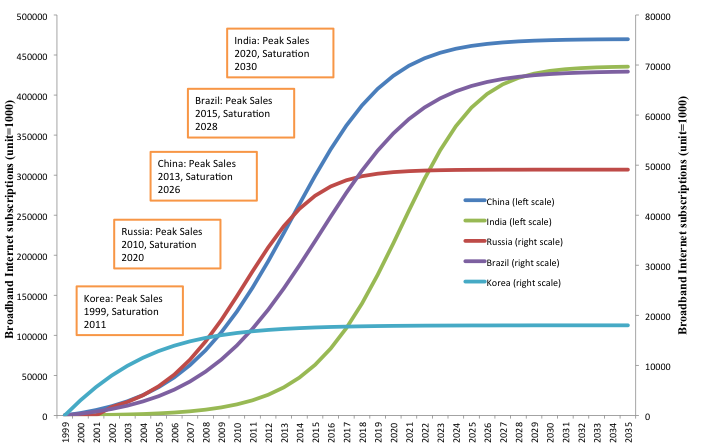 Russia already passed peak sales in 2010; China reaches this point in 2013, and Brazil in 2015. India’s take off, by contrast, is slow and in terms of market penetration it is more than a decade away from the rest of the BRICs. In absolute figures, however, India outgrew Brazil in 2011 and will bypass Russia in 2014. China is clearly the largest market and until 2024 India, Russia, and Brazil combined will not outnumber broadband users in China. Now get back to the chart on download speeds for the BRICs. 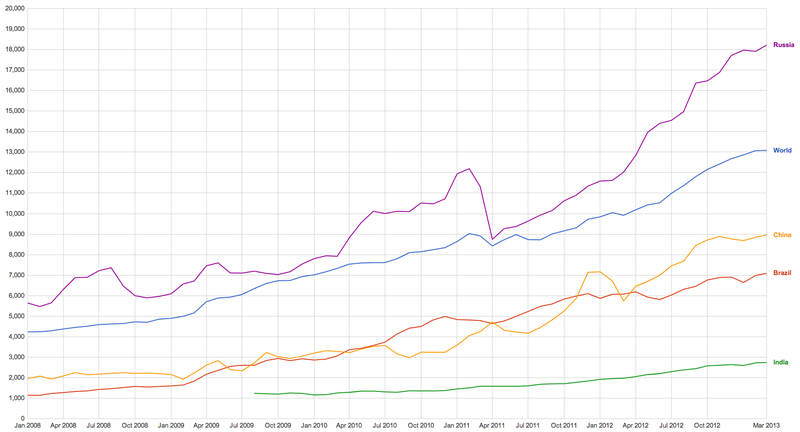 When did Russia start its takeoff; yes in 2010/11 after peak sales were reached. And here is one key to the puzzle. During early adoption stages the broadband market tends to be demand-driven. ISPs add users to their customer base in a much faster pace than they increase backhaul capacity. They do so because plenty of people are willing to pay high subscription fees for nominally faster speeds. The real speed, however, is much slower as the fiber lines become rapidly crowded with more users. High prices generate a handsome profit and at least some if it will be reinvested in more capacity. The amount that ISPs spend each year on improving infrastructure, therefore, depends not so much on demand but on profits. 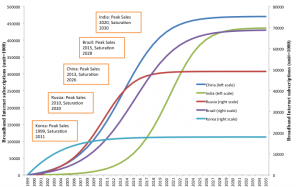 Once peak sales are reached pressure from a rapidly expanding consumer base eases gradually while investments in backhaul capacity remains relatively constant. The reason for stable investment levels is straightforward. In the early days of Internet adoption ISPs try to get a foothold in the market; the more customers the better. Later on they need to consolidate their market share. In a supply-driven market ISPs compete for increasingly picky users that expect better service, faster speeds, and lower prices. In my next blog post I will write about different broadband technology regimes in order to render insight into another type of digital divide – diverging upload speeds. In particular I will try to explain why Russia is performing better than Sweden but still is on the wrong track, and why China will outperform most emerging markets in the near future. 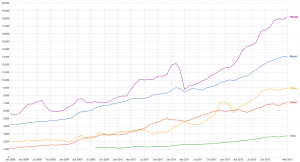 This entry was posted in Uncategorized and tagged BRICs, broadband, China, data infrastructure, forecast, ICT policy, Internet access, Internet market, speed, technology adoption. Bookmark the permalink.